Wikipedia is widely known as an online text dictionary. At the same time visuals are hardly used. Since it has been founded in 2001, not much has changed in the appearance of the pages. The editors are generally well schooled and used the same way of defining their entries. I rather call them ‘text/code readers’. They generate the major contents on Wikipedia with textual information with little visual support. On one hand they contribute expertise on the WWW, on the other hand this knowledge amounts to a lack of visibly attractive elements to the big population of the Internet users. There are about 740,000 Wikipedist globally , and more than 300,000,000 active users on Facebook . The number shows the popularity of two revolutionary web 2.0 sites obviously, but what is the key factor for the numerical difference between Wiki and Facebook? Yes, Picture Era is now. From what I know, Navify, branded itself as multimedia encyclopedia has already launched . Though Wikipedia is now publishing its beta version, which offers relatively more modern interface, it is far from engaging the rest of the world to join the wonderful journey of sharism. Is Wikipedia forcefully going against the trend? They seem to have reason to go. Navify’s interface combining the function of Wikipedia, YouTube, Flickr, and commentary. -Legality. Wikipedia greatly respects copyrights. As it clarifies “do not quote more than a couple of sentences of text from anywhere, and document any references you do use. You can copy material that you are sure is in the public domain, but even for public domain material you should still document your source.”  It works for text easier than images or videos. Because visuals are external and independent, even you are the drawer of your illustration you can’t assume everyone knows but to prove the external visual attachment is under your copyright, since all self-published work must have been licensed by their creators before they are uploaded. What is more, legal issues are complex. Image copyright laws vary from country to country. -Source. There are mainly two sources for visual references: self-published and public domain sources. As noted above, for publishing, some skill is required. Public domain is normally the first choice. Scanning from public readings is also allowed. However, it is largely inconvenient to double-check the validity of each reference you shall use for editing Wikipedia. The consumption of knowledge, time and energy on the proof of source becomes a barrier for a good number of grassroot users. However, Wikipedia is not the only website confronting these problems. Besides objective causes, Wikipedia itself also has its responsibilities on the present status. With the academic look and feel of their module and organizational structure, Wikipedia intends to prevent from the so-called amateurs to participate. Meanwhile, from the homepage to the user pages there is nothing to catch the attention of a 13-year-old kid. Their text-oriented interface compared with any other well-known web 2.0 network is with no doubt not user-friendly. The lack of delicate consideration of design and layout increases the irritation of over-load information. Before we name Wikipedia the symbol of user-generated knowledge and icon of new democracy, we’d better think twice. There are still a lot of limitation and questions in Wikipedia. To see it positively, there is big space to improve for this international encyclopaedia to really become universal, meaning to cross culture, age, intelligence, etc. Possible solutions are discussed below. -Set up association with the main video and image provider. In terms of video, Youtube for international, Hulu for America, Youku for China, etc. For images, websites like Flickr can provide wealth of photograph source and Ffffound with continuous updates of high quality work by illustrators/designers. Legal issues can therefore be carried by multiple communities and the ability for Wikipedia to deal with copyrights will then be strengthened. -Visual database should be constructed on a global level under the management of Wikipedia. Users with visual creating capability or legal access to existing visual resource can contribute their collections for the free use of any Wikipedist. -Interface of Wikipedia should be designed with stronger graphic support and for the benefits of users, a bit fun and creativity. Also there is an intensive ignorance of contributors’ characteristics. If there can be slightly more freedom to present the users’ individuality, Wikipedia should to able to draw interests to wider potential members. The endeavor to make Wikipedia a better-visualized platform is so far very little notable. It claims great professional knowledge on visual communication, legality, technology, psychology, etc, and not to forget: passion. It is worthy to believe that Wikipedia can become as tempting as those mass popular networks. Fantastic analysis of the problems of a more visually-based wikipedia, and sharp ideas for remedying it. Thanks! It’s heads-on addressing the issue of text/image in a collaborative interface. Google tries to integrate everything we need for internet life. sooner or later the whole WWW will be Google zoned and we can hardly step out of Google interface. plus so far, everything is for free. I am already an infected. everyday the moment i open my laptop i check google reader for news, gmail for emails, google docs for homework, google apps for managing sasaye.com mails, and video chat via google talk. it is a much more friendly platform i have to admit. There is some work being done on adding collaborative media editing to Wikipedeia. Specifically, http://kaltura.org/ has received a grant to incorporate their collaborative media framework into Wikipedia, and they’ve hired the main http://metavid.org/ developer to build it out. There was a talk at http://openvideoconference.org/ where Mozilla debuted the planned interface which is to be written in html5 and use only ogg media, but I wasn’t able to dig up that video, perhaps it’s in the livestream archive. 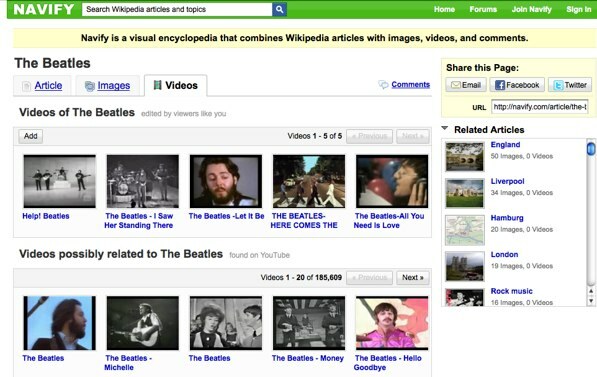 One of the problems with having groundbreaking media capabilities added to Wikipedia, is that all software and technology used in the project must not be encumbered by patents, it’s really only with the advent of html5 that adding video to the Wiki has been possible without using Flash or a proprietary video codec. As far as adding images to the wiki, Kaltura’s tech will be able to provide a nuified media editing interface, but embedding images/video in an article is perpetually going to require that specific licensing has been granted by the image author, I believe Creative Commons licenses of the attribution-share-alike or attribution varieties are preferred. This is also created by James Wales. Much more light hearted with videos and images in its entries. How come they don’t have serious patents issues on this network? I think it mostly has to do with wiki being for-profit and advertisement funded. Since they have income, they can afford to license mpeg4 and flash technologies, but Wikipedia has to be more egalitarian. One constraint that the developers place themselves under is a strict dedication to badwidth compatibility. They want Wikipedia to run flawlessly in low bandwith areas of the globe, even have OLPC school servers be able to cache the entire database. I think the addition of media editing to the system has been a very hard won battle. I’ll post this link in irc to see what the Kaltura/Metavid/Wikimedia folks have to say. I read the interview to James Wales. His persistence on Wikipedia’s non-profitable charity positioning somehow becomes its limits. When I see the Chinese version of encyclopedia, I think no wonder very few participants from China on Wikipedia! It is not the best but very dynamic and grassroot. It even has a image encyclopedia. It is good to see that change. they do have to visualize their ugly text ads in a more engaging form.